As a young cook, one of the most intimidating things to make for dinner is a roast chicken. It should be simple but somehow it seems complicated–tying up the legs, stuffing the cavity, etc. It took me many years to feel confident about the bird thing. The carving alone could set you over the edge. I conquered my fear and while I’m not the best carver in the world I make do and figure it out. The key to carving is letting the bird sit for at least 10 minutes. This seals in the juices and makes carving just a bit simpler. I can’t really help with the carving (you can go online and get a tutorial). I go by feel. I used to take a 5 lb chicken and hack it up so badly, but after a few attempts, I sort of figured it out and I’m sure you will too. I use an organic chicken, which you can get in any supermarket now. I just prefer it. Kosher is also very good here. Also, always pat the chicken dry with paper towels. This little tip goes a long way to a delicious chicken. I will keep a chicken frozen and take it out the night before to defrost and then the next day put it in the fridge to finish defrosting. It’s such a homey meal to make and your house will smell divine. You may need to make this a few times to perfect it. Practice makes perfect. I always say if it’s a new recipe don’t make it for company . The time to practice is on yourself or your family . I try to never make a new recipe for guests it’s too stressful and why do that when I have so many tried and true recipes that I can count on. Just saying…. Olive oil (I use about 2 tablespoons which I put in a ramekin to brush the chicken) you may use a little bit more or less . You also need a bit for the pan veggies. 1 bulb fennel, tops and sprigs removed and cut into wedges or slices–I love fennel but if you don’t use it it’s OK. The onions and vegetables are still delicious. fresh thyme–I stuff almost the whole package into the chicken cavity. I leave out a few sprigs to sprinkle over the vegetables. Preheat oven to 425 degrees F. You will need a roasting pan with sides deep enough to roast chicken with gravy. Remove the chicken giblets inside of cavity of chicken. ( I don’t use them so I toss them.) Rinse the chicken inside and out. Remove any excess fat and leftover pin feathers, and pat the outside of chicken dry; this is most important. I use a bunch of paper towels to do this, just wrap up chicken and let it dry while I am prepping everything else. I peel and cut up carrots, slice the onion thickly, cut up the fennel bulb, and put aside. Next, take chicken, and put some kosher salt and freshly ground pepper inside of the chicken. Stuff the cavity with the 2 halves of lemon (that’s why I use a small lemon) and stuff in all the garlic with skin and all. If you have the thyme, stuff this inside as well leaving out a few sprigs for veggies. Put carrots , onions, fennel into a large roasting pan. 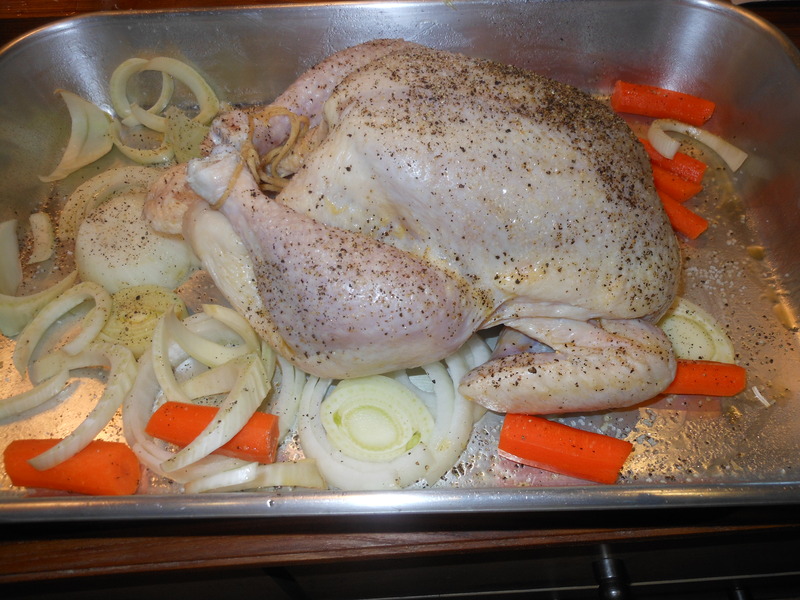 I place the chicken on top of some of the onions, scattering veggies around the chicken. Brush (silicone or pastry brush) the outside of the chicken with the olive oil all over chicken, and sprinkle with salt and pepper. I am fairly generous here with the salt and pepper, but don’t go overboard. Tie the legs together with poultry twine, and tuck the wings underneath the body of the chicken. (Don’t sweat the tucking, the wing tips might get a little burnt if they are sticking out.) Put a little olive oil over veggies (a very little) and using a spoon, mix around. If you are using the thyme, scatter the remaining sprigs around the veggies. I sprinkle a very little bit of salt and pepper on the veggies as well. Roast the chicken for 1 1/2 hours (check on it after the first 45 minutes). When you check on chicken use either a baster or a large spoon and pour some of the pan juices over the chicken. Also add a little water or chicken broth to the roasting pan just to make a little more gravy, maybe 1/2 cup that’s it. If during the cooking process the liquid dries up just add some more water , just don’t let the pan dry out. The chicken is done when you cut between a leg and a thigh and the juices run clear or a meat thermometer reads between 165 and 175 degrees into the leg. I then remove the chicken, leaving the vegetables in the oven for another 10 minutes or so. I place the chicken on a plate and let it rest for at least 10 minutes (20 is perfect) with aluminum foil. I slice the 2 breasts into pieces and remove the 2 drumsticks and thighs. I then take out the veggies, and serve with the chicken, and a little gravy from the pan juices. *internal temperature when a chicken is done should be at least 165 degrees. I usually cook till 175 degrees. I also allow to sit for easier carving and chicken will actually continue to cook, and so temperature will go up. I tent in aluminum foil while it is resting so it doesn’t get too cool. 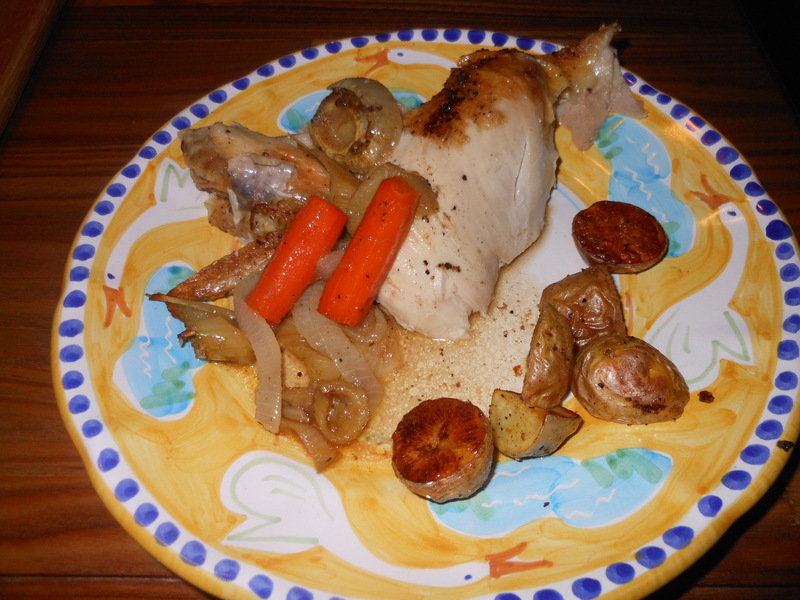 This entry was posted in chicken and tagged chicken roasted, Comfort Food, Nothing Like a Good Old Roast Chicken, roast chicken. Bookmark the permalink. I have been told I make the best roast chicken ever! I put all the veggie and herbs inside(i use garlic, onion and fresh rosemary branches), i also salt the inside and out of chicken. Once it’s in the oven a bit I squeeze a lemon all over. I don’t tie the legs or add any oil. My big trick is using a glass pan! Re-blog Monday and the Jewish holidays are over and we get a breather till Thanksgiving. Roast Chicken while being a bit intimidating to cook is one of the ultimate in comfort foods. If you’ve never made it give it a try. Super comforting , healthy and delicious. Enjoy! thanks a lot for nomination. Happy you are enjoying.